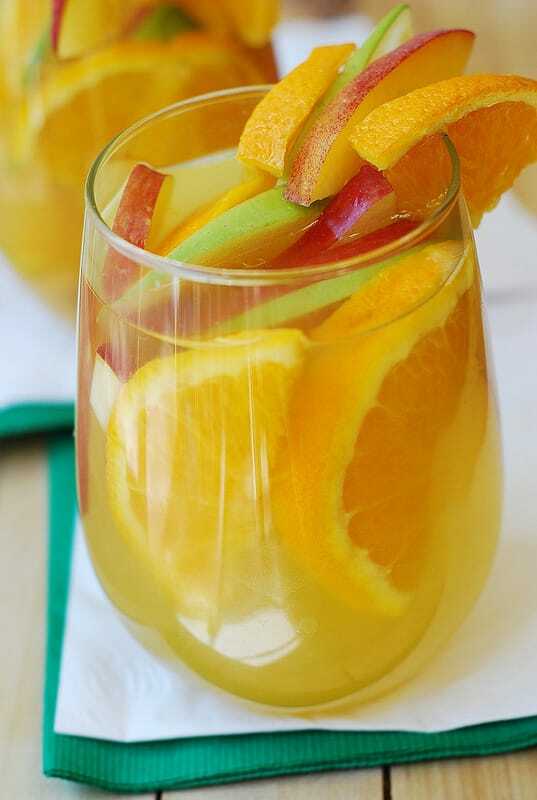 White sangria made with dry white wine, Peach Schnapps, brandy, orange juice and lots of fruit, such as peaches, apples, oranges. To add fizz to your sangria, add some carbonated beverage (such as ginger ale or citrus soda pop) right before serving. Sangria is an alcoholic beverage. The classic sangria which has Spanish origins is usually made with red wine, brandy and other ingredients, such as orange juice, lemon or lime juice. There are many varieties of sangria these days. 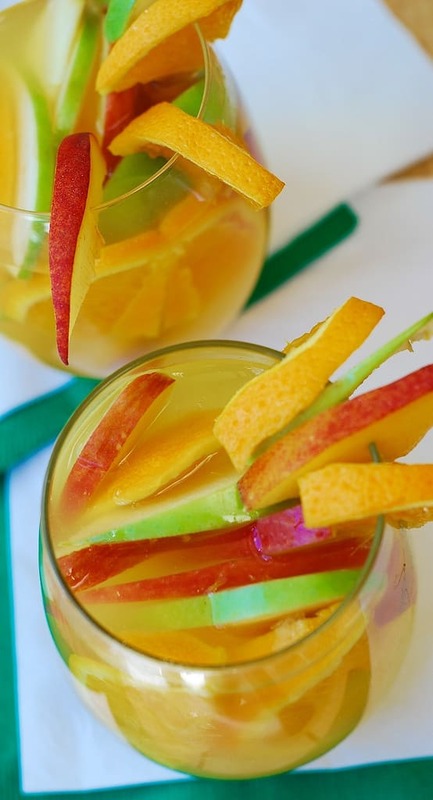 White sangria is very popular, and white wine is used instead of red wine. 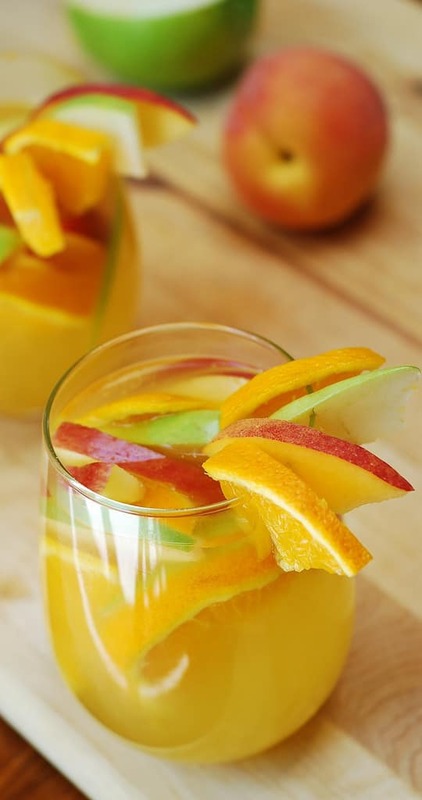 When making white sangria, fruit is often used, such as peaches, nectarines, apples, pears, etc. It is mid-June, and it means it’s time for Sangria cocktails! 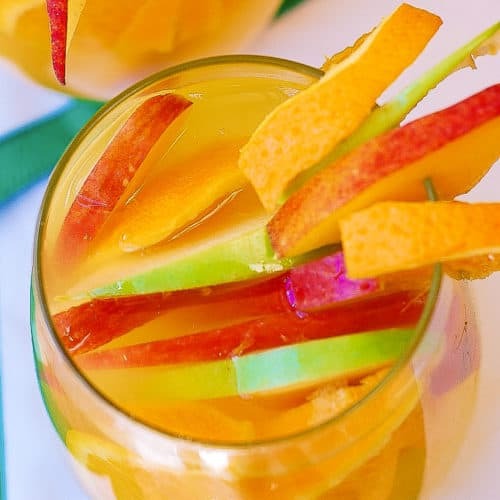 White sangria is a lighter and fruitier drink than red sangria, and, therefore, it is perfect for sipping in the Summer at the pool, sharing it with friends at cook-outs, pool parties, etc. I love to add apples to white sangria – they add wonderful flavor to the cocktail and also taste great with all the alcohol soaked up! As you can see in the photos, I added both green apple (Granny Smith) and red apple (Gala), along with peaches and oranges, for presentation purposes as well as because they both add individual flavors to the drink! So good! White sangria is quite easy to make, once you have all ingredients in place. Just place all ingredients, including fruit but excluding bubbly stuff, into the pitcher. You may also leave out some fruit (especially if it won’t fit with others in the pitcher) to freeze it and use it for ice when serving! Tip: Make sure to refrigerate the sangria overnight or for at least 8 hours (up to 12-16 hours) – all the flavors will have time to combine, and the fruit will soak up the liquor and will be so delicious! There is a marked difference in the drink if you don’t let it sit in the fridge for several hours. Let the fruit soak for at least 8 hours in sangria. How to sweeten sangria? Dissolve 1/4 sugar in a small amount of hot water, cool this “sugar syrup” and mix with Sangria. Alternatively, use honey or agave. Do you need to sweeten sangria? You might not need to add sugar syrup to the pitcher at all. Taste and see if the sangria needs sweetening. White sangria is already pretty sweet, but some people like it sweeter. In deciding just how sweet your sangria should be, consider that after the sangria has been refrigerated for several hours and cooled, you will also be adding sweet ginger ale or soda pop to each serving glass right before serving, for fizz. Therefore, you might not need sugar syrup at all. Tip: Before refrigerating the sangria, I would suggest making a sample drink with ginger ale (citrus soda pop, sparkling water, etc. – whatever you would use to cut the drink) to taste for sweetness and decide whether to add sugar syrup or not. Freeze peach slices and add them to the pitcher as “ice” right before serving. When it’s time to serve, cut the sangria with ginger ale or soda or sparkling water right before serving. Then, fill the rest with white sangria and fruit! White sangria - a perfect Summer cocktail drink! 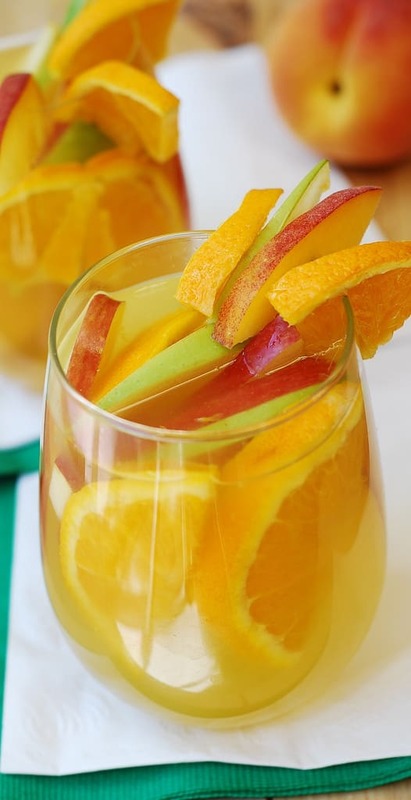 It's made with dry white wine, Peach Schnapps, brandy, orange juice and lots of fruit, such as peaches, apples, oranges. Add fizz to your sangria by adding some carbonated beverage (such as ginger ale or citrus soda pop) right before serving. Place all ingredients, including fruit, but excluding sugar syrup and ginger ale (or citrus soda pop), in a pitcher and stir to mix. You may leave out some fruit (especially if you have too much of it, and it won't fit with others in the pitcher) and freeze it and use it for ice when serving! NOTE: You might not need to add sugar syrup to the pitcher at all. Taste and see if you need to add it to sweeten the sangria up to your tastes. In deciding how sweet you want your sangria, keep in mind that after it's been refrigerated and cooled, you will also be adding sweet ginger ale or soda pop to each serving glass right before serving - therefore, you might not need sugar syrup at all. Before refrigerating the sangria, I would suggest making a sample drink with ginger ale (citrus soda pop, sparkling water, etc. - whatever you would use to cut the drink) to taste for sweetness and decide whether to add sugar syrup or not. If you like, you might freeze some peach slices and add them to the pitcher right before serving. Refrigerate at least 8 hours ( up to 12-15 hours) before serving. Serve over ice. Cut the sangria with ginger ale (or citrus soda pop, or sparkling water) right before serving it - pour ginger ale at the bottom of the glasss, about 1/3 and fill the rest with sangria and fruit. Serve over ice. I swear by this sangria…it’s delicious and definitely a crowd pleaser! Really, you recommend leaving it in the fridge overnight? That’s interesting. Whenever I’ve seen sangria they always serve it right away. Will have to try this option! Julia, this sangria looks fabulous! I love all the fruits 😀 I totally agree this is a great summer, sitting by the pool, hanging out on the deck kind of drink. I haven’t made sangria in ages! And usually make red. I need to shake things up and make this! Love its looks and the ingredients in it. Thanks. This is gorgeous, Julia. I love peach taste in alcohol, the only flavor I like it. With all these fruits… super good! Wow, this sangria looks amazing Julia! Love the flavours and any drink that contains peach schnapps is one I need to try! Perfect for Summer!